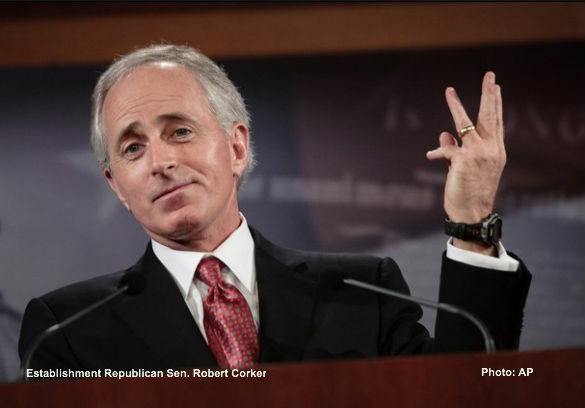 Standing on conservative principle – such as opposing the spending that implements Obamacare – is silly, at least if you are an establishment Republican, like Tennessee's Senator Robert Corker. Corker is the latest in a long line of establishment Republicans to ridicule and oppose the efforts of Utah’s principled limited government constitutional conservative Senator Mike Lee and others to defeat the spending bills that implement Obamacare. In Corker's formulation such an effort is "silly" and those in favor of it "don't have the courage to roll up our sleeves and deal with real deficit reduction and spending decisions." So let’s see if we have this right. Senators Mike Lee, Rand Paul and Ted Cruz oppose Obamacare and they oppose spending money to implement it. Senator Corker and others claim they oppose Obamacare, but they support spending money to implement it. We will leave it to our readers to tell us which is more ridiculous: spending money on something you claim to oppose, or opposing Obamacare and all its works. This ain’t rocket science, all it takes, as Senator Lee observed, is for Republicans to vote NO. "If Republicans in both houses simply refuse to vote for any continuing resolution that contains further funding for further enforcement of Obamacare, we can stop it. We can stop the individual mandate from going into effect," Lee told "Fox & Friends." Lee’s key point is that withholding money from further enforcement and implementation of Obamacare and would not affect the portions of the law already in effect, including provisions on pre-existing conditions and children being able to stay on their parents' plans until age 26. Lee’s goal – and it is one we heartily endorse – is to take-out the individual mandate. Corker, who claims to oppose Obamacare and be a fiscal conservative, is also the co-author of the infamous “Corker – Hoeven amendment” that paved the way for the passage of S. 744, Senate’s Gang of Eight amnesty for illegal immigrants bill. The public ridicule from Corker, and others of his ilk, is obviously intended to support the behind the scenes maneuvering by Senate Republican leader Mitch McConnell, Senator Ron Johnson of Wisconsin and other establishment Republicans to stymie the Lee effort to defund Obamacare. The reluctance of the Senate Republican leadership to draw a line in the sand and join conservatives like Lee, Paul and Cruz to stand against Obamacare is even more puzzling when one looks at the results of the latest CBS News poll on the issue. The new CBS News poll found that more Americans than ever – 54 percent – disapprove of Obamacare (the Affordable Care Act). But the establishment’s clumsy effort to stifle the Lee’s plan to defund Obamacare has prompted a surge in grassroots conservative demands for Senate Republicans to back Lee’s efforts to stop Obamacare before the Obama administration begins to fully implement the law. Conservative commentator and talk radio superstar Mark Levin, the Club for Growth, Heritage Action and Freedom Works all weighing-in to support of Lee’s effort. In ridiculing an effort backed by conservatives Mike Lee, Rand Paul and Ted Cruz, as well as more establishment-type Republicans like John Thune of South Dakota and Mark Kirk of Illinois, Corker is playing by the typical Capitol Hill rules of say one thing, while actually doing another. Republicans, by voting to fund Obamacare, are putting people out of work, driving up healthcare costs, and hurting families. Republicans are not listening to voters who hate the law if they fund Obamacare. Any Republican, starting with Senate Republican Leader Mitch McConnell, who chooses to fund Obamacare should be primaried. With 54 percent of those polled telling CBS that they disapprove of Obamacare and 38 percent saying they expect to be personally hurt by the Obamacare law, the advertisements in those Republican primaries, as Erick Erickson said, write themselves. Submitted by nikkibj97 (not verified) on Thu, 08/01/2013 - 13:53. The reason why the survey reflects a 54% disapproval is because of the amount of money pouring in from the likes of the Koch brothers and insurance company's spent in ads to confuse the general public that it's bad, which of course it isn't. Submitted by w1ndjamm3r on Fri, 08/02/2013 - 12:15. I will never participate in the Government Healthcare Scam. Look at your pay stub as to how much is taken for one tax or another for entitlements and other issues. Now the ACA is going to add another tax to that just for you and all the others to support something that can never ever work by providing health care to millions that will never pay a penny for it. We have a great health care system that needs real changes that will help lower costs, not a new entitlement program that raises costs on an unrealistic basis. I am glad that I am a senior citizen with a limited amount of time left on this stupid planet and in a country that is hell bent on destroying itself in mamny many ways because of closed minded do gooders (Big Brother addicts) such as yourself. I fortell that you and others like you will come to regret this "good change" in the future. Submitted by Cape Conservative on Wed, 07/31/2013 - 22:15. If it isn't NC's Burr dissing the strong stance of conservative Republicans such as Mike Lee and Ted Cruz, along comes Corker with his 'silly' comment. How about just ONCE standing for our Constitution - all together, folks...hold hands and Just Say No! If Max Baucus, the DEMOCRAT who was a sponsor of the bill, says it is a TRAIN WRECK, what on earth is holding any one of the Republicans back from Just Saying NO??? As for the leadership's failure to LEAD, I am of the firm opinion that the administration has something on all of them and rather than face the music, they are capitulating to every demand from the other side of the aisle. NOT GOOD! I agree...ANY member of Congress who does not go along with NOT FUNDING the ACA should be primaried! We will send a contribution to every conservative who will take that challenge! Submitted by culper355 on Wed, 07/31/2013 - 15:36.
seems to come easy to the establishment. Americans with ANY sense at all want the HORROR gone. Fast and furiously! So Mr. establishment you should be primaried, and be kicked out of office. Consequences for the establishment NOT following the "wishes of the people" should be loss of pension and ALL benefits! If they could find a job in the private sector they'd soon become another statistic on the welfare rolls. Submitted by Joseph C Moore-... on Wed, 07/31/2013 - 11:49. Why on earth do people keep voting for these lying, (and in Corker's case) smirking politicians. There should be a standard of eligibility for voters, as the public has shown great stupidity in their choices of (representatives) who represent their own malfeasance for personal gain and unconstitutional aims. Where's the Tea Party Pressure? Submitted by neal.hightower1 on Wed, 07/31/2013 - 11:06. I understand they are going after Alexander. I don't know when Corker is up for election but there should be tons of pressure put on him. But it's just not TN. Where is the Tea Party in OH (Bonehead), VA (Cantor), WI (Ryan), FL (Rubio)? I don't hear of the Tea Party holding anyones feet to the fire and pressuring them. Ryan is an open borders guy. Rubio is for Amnesty. Cantor is out sucking up with Menendez and touting the Dream Act. We got our own problems in Texas with Cornyn. But at least he knows we are watching him. He is just a bonehead and doesn't grasp the concept yet. He will have a primary challenger. All these boneheaded morons have to go. 2014 is it. If we Don't get it then it is over! Submitted by david.is.farrar on Wed, 07/31/2013 - 10:09. I, too, stand and admire Sen. Cruz for what he is standing up for. But there is another I admire even more, my own House Rep. Tom Graves, who has filed a companion bill in the House. Any medical plan that has as its collection agency the IRS, and the IRS wants out of the plan....the plan should be stopped and reworked, equal protection, fifth clause of the 14th Amendment, or maybe just street smarts. Let's win the Congress in 2014, and work with Obama on developing a sound medical insurance policy. I, too, as a committed fiscal conservative Republican Tea Party supporter, am tired of being the victim of medical insurance companies and the structural monopoly the medical industry has in the health care sector of today. There needs to be structural competition. If Republicans and Democrats can agree to that, in Principle, ObamaCare should be given a coup de grâce and stopped in its tracks as soon as possible. Submitted by neal.hightower1 on Wed, 07/31/2013 - 12:26. I think if the government removed itself completely from Health Insurance and regulations completely then the free market would prevail. Negotiating or compromising with anyone I disagree with is useless.